I’m sick of talking about me. Let’s talk about some of the truly gifted sewists I’ve had the extreme pleasure of meeting and working with. Today I’m featuring a lovely woman that took both levels of my serger classes at Fabric Depot in Portland. Rebecca took off flying with her up cycled sweater designs. 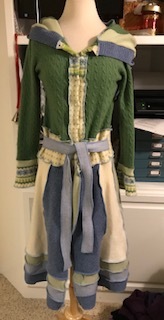 She carefully scours the second hand clothing stores for sweaters and fabrics to make into these fabulous sweater coats. They are each a unique and creative work of art, pieced together using a 4-thread overlock stitch. She uses patterns and inspiration by Katwise, adding her own design twist. Students send me lots of photos of their makes and I’ve decided to start a little series featuring these. I hope you enjoy them and find inspiration in their works and stories.